Summer carnivals bring colorful booths lined with games of chance, offering participants a chance to take home a prize. Faced with the choice between oversized stuffed toys or an unassuming, space-saving goldfish, the carnival goldfish often finds himself on his way to a new home which is many times unprepared for his spontaneous arrival. While goldfish can live up to 20 years, your carnival fish's life span depends upon the environment you're willing to provide. All too often, carnival goldfish find themselves living in small bowls eating bits of dog food or dried bread. Unless you change the water completely every day or two and provide proper nutrition through goldfish pellets, your pet fish probably won't live more than a week. Extend life expectancy by purchasing a 5-gallon or larger tank with filtration and a heater. 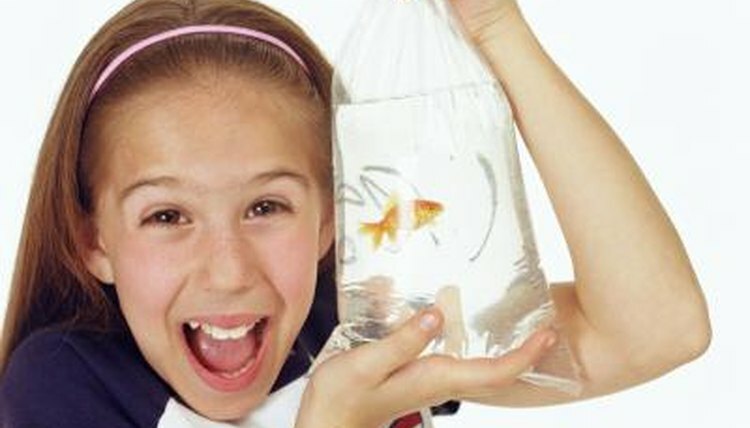 If you're willing to invest in the long-term needs of your carnival goldfish, he may live in excess of 20 years. The longest-lived known carnival goldfish was won from a fair in Yorkshire, England in 1956. The fish lived until 1999, dying at the age of 43 years old.